Яблочный пирог! Или яблочно-грушевая шарлотка. Год моему блогу. Добро пожаловать в закулисье! 35! и вот что я об этом думаю. 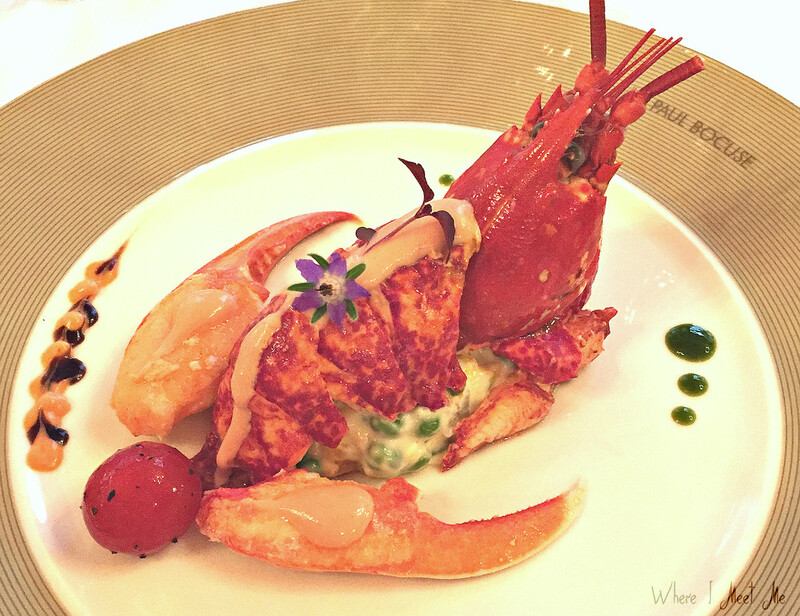 So you think Paris is the capital of French gastronomy? Read our story from Lyon! To be honest, I was only guessing that we are heading to a gastronomically advanced city until… “Lyon – the capital of the world’s gastronomy” – said, quite officially, a screen in the French visa centre, and proceeded to show a colourful video as a confirmation: appetizing baguette crusts, exquisite glasses filling up with red wine, soups lining up into a polychromic infinity and – the culmination – stunning desserts with strawberry-mint contrasts. That’s pretty logical, I thought, as the main point of our trip was a week-long immersion in haute cuisine in Institut Paul Bocuse in Lyon, France (stay tuned for a special post on this one). 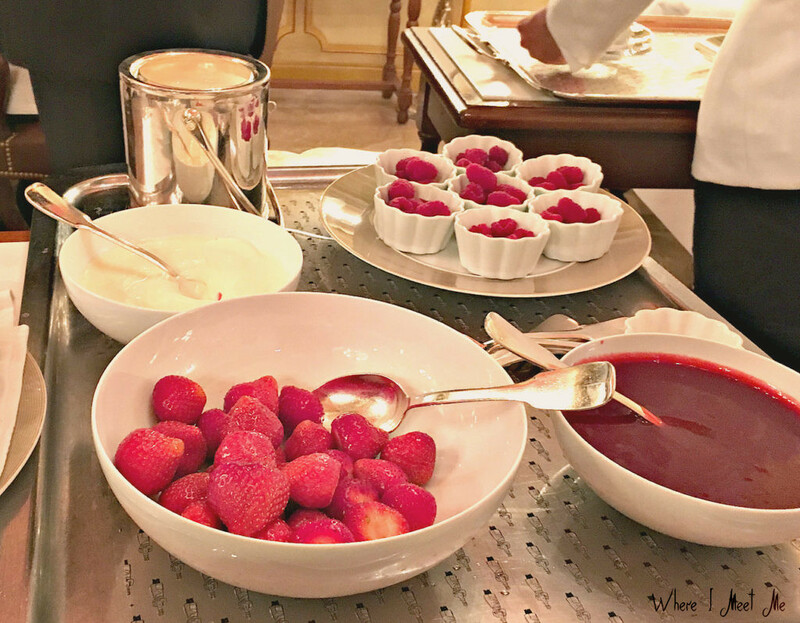 And in case this doesn’t really ring a bell, let me explain: traditional French cuisine and the world-famous chef Paul Bocuse are two main attractions of Lyon city. And, as we were told, the two are practically the same thing. Of course, it’s not only the gastronomic attractions that make this city a top destination. Lyon is a beautiful city with charming landscape, confluence of two rivers Rhone and Saone and stunning views of the historical city centre. Lyon city hosts a lot of events unrelated to high-end cooking – check out this amazing video of the annual Fête des Lumières as an example! But haute cuisine and it’s most famous living symbol, twice named Chef of the century – in both 20th and 21st centuries (1989 and 2011) – is everywhere. 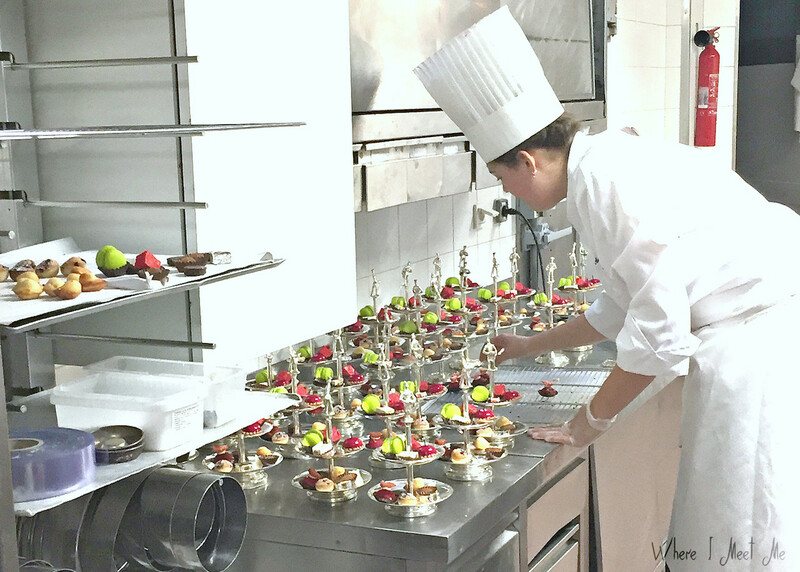 You have restaurants and brasseries opened by the maitre and his students all around Lyon, a bridge and an upscale market named after him, and THE dream place to visit – restaurant Paul Bocuse. As it’s often the case, his greatness did not just come out of the blue. 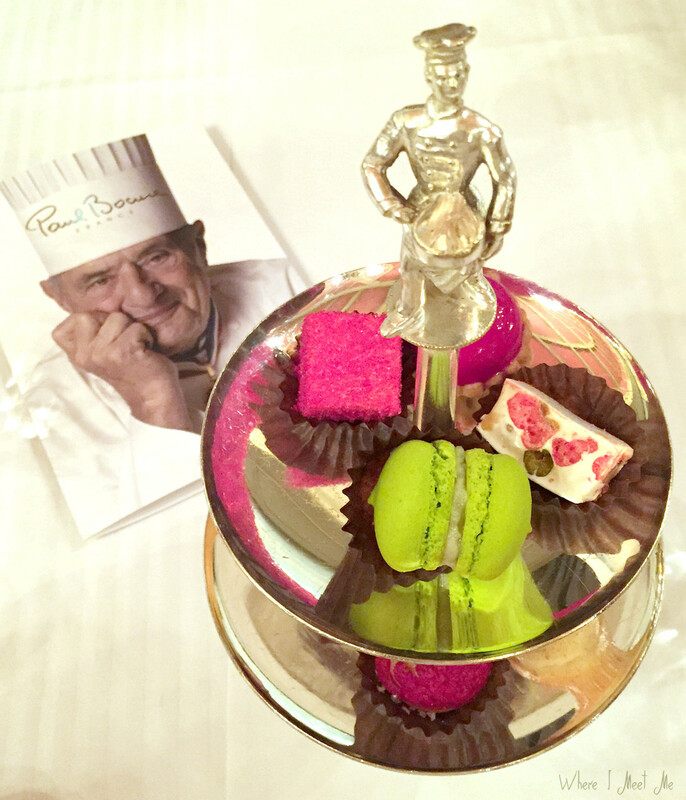 Paul Bocuse was born into a family of chefs near Lyon, which was already famous for its gastronomic culture. As locals explained to us, when the silk business started to decline in nineteenth century, and many rich families couldn’t afford to have servants anymore, their private cooks, left without a job, started opening what we would now call “restaurants” – but the lyonnaise have a very specific term – “bouchon”. We did not know this story at first – we strolled around the city and couldn’t quite get why at least half of all the dining places were called “cork” – a direct translation from French “bouchon”. A side note – one of the reasons I love French is that one word can have extraordinarily different meanings. A minute of French: “bouchonner” means grooming a horse, so in a “bouchon” the travellers could have a meal and refresh, and give their horses some water, food and rest as well. Young Paul Bocuse was apprenticing in the kitchens of Lyon, where he learned from the famous meres lyonnaises. This is another local phenomenon – mothers and wives of Lyon men who went to war, opened the doors of their houses and served their traditional home-made food. As biographers tell us, this countryside cuisine – simple and generous dishes cooked from the freshest local products – was the main inspiration for Paul Bocuse. Salade lyonnaise (green salad, bacon strips, croutons and a poached egg), pike quenelle, Poulet de Bresse aux morilles, shellfish gratin – all these traditional dishes can be found in the majority of local restaurants, and in the Maitre’s establishment you can taste the traditional version in all its glory. In 1956 Mr. Bocuse headed his parents’ restaurant, and in 2 years he got his first Michelin star, in 4 more years – the second one, and in 1965 – after 9 years of being the Chef – the third one. Since then restaurant Paul Bocuse is one of the 27 three-Michelin star establishments in France, which, as described in the Michelin guide, “is worth a special journey… chefs at the peak of their profession. The ingredients are exemplary, the cooking is elevated to an art form and the dishes are often destined to become classics.” So we thought it is must-visit place, indeed. Our first impression? Pure joy! The restaurant – by the way Paul Bocuse still lives in the same building to this day – i.e. not figuratively speaking, but for real: the man lives in his office (or restaurant in this case) – is the liveliest green-grass coloured building with pink window blinds and orange decor, it’s facade painted with golden roosters and stylised gourmet foods. Same style inside – the walls are covered with gastronomic paintings and genre scenes in the recognisable restaurant interiors. There’s no doubt who’s the boss here. 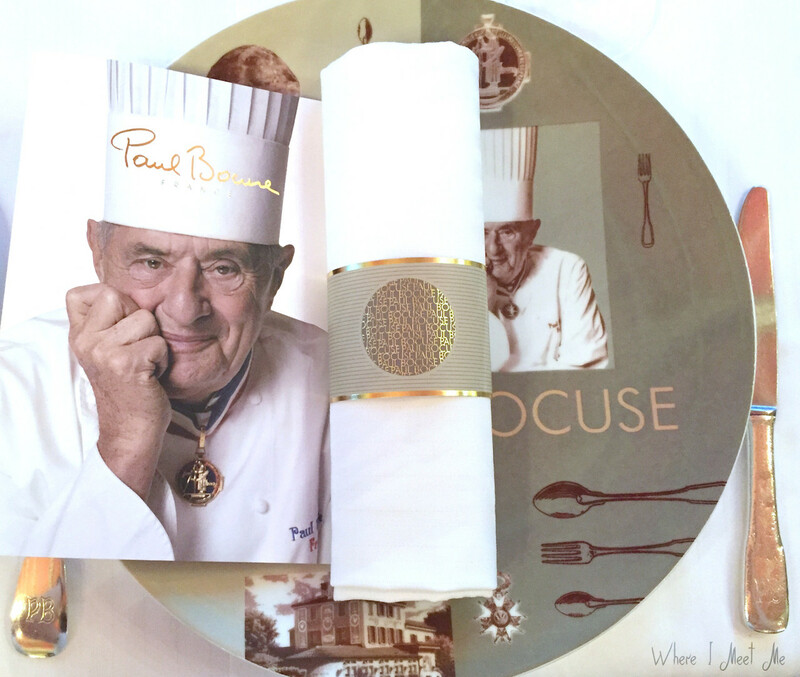 Paul Bocuse rests his chin upon his right hand and closely watches us from the plates, menu, walls and book covers in a small shop in the restaurant. He is currently 91, and he hasn’t been going out to greet the guests for the past few years, but he still participates in his businesses, including the restaurant, Bocuse d’Or – the most prestigious chefs competition in the world and Institut Paul Bocuse – the real source of talents for Michelin restaurants and luxury hotels. As Stanislavsky famously said: “Theatre begins at the cloakroom”. Well, following this simple analogy, restaurant Paul Bocuse begins with the most charming Daniel, the doorman, who greets the guests with his inviting smile for more than 20 years. After all these years he became a symbol of the place – we even see him on some of the paintings decorating the walls, though of course they are not out-numbering Mr. Bocuse’s portraits. There is a birthday celebration on a neighboring table – and the entire crew comes out to sing the birthday song – Monsier blows the candles out to the touching tune of an old music-box playing in Daniel’s hands. We all join the applause – such a magical feeling! Hot time in the kitchen: 20.30. The guests already arrived and made their orders. We are in the kitchen fainting of happiness as we meet the celebrity chef Gilles Reinhardt, young and dynamic, a great contrast to the cliche of overweight, always-yelling-not-happy-with-anything chefs from the TV shows. Gilles tells us he has been working here for more than 20 years (do you notice a trend? ), started from an entry level role of “comis” (basically you wash, peel and cut for the whole 12-hour shift, never having a chance to sit down), and then became a sous-chef and chef. There is a kind of unique professionalism over-arching everything in this institution. On the restaurant’s website you will find the name and photo of each employee – including the chef, the waiter and the dish-washer. An amazing respect to individual – doesn’t matter whether it’s a client or an employee. By the way, we saw no one screaming “oui, chef!” in the kitchen, or running around dropping casseroles, nothing is getting burnt on the stoves. Every one calmly is minding their own business. Copper kitchenware is shining. One bird is rotating in the big rotisserie – looks like there’s only one pigeon ordered so far. 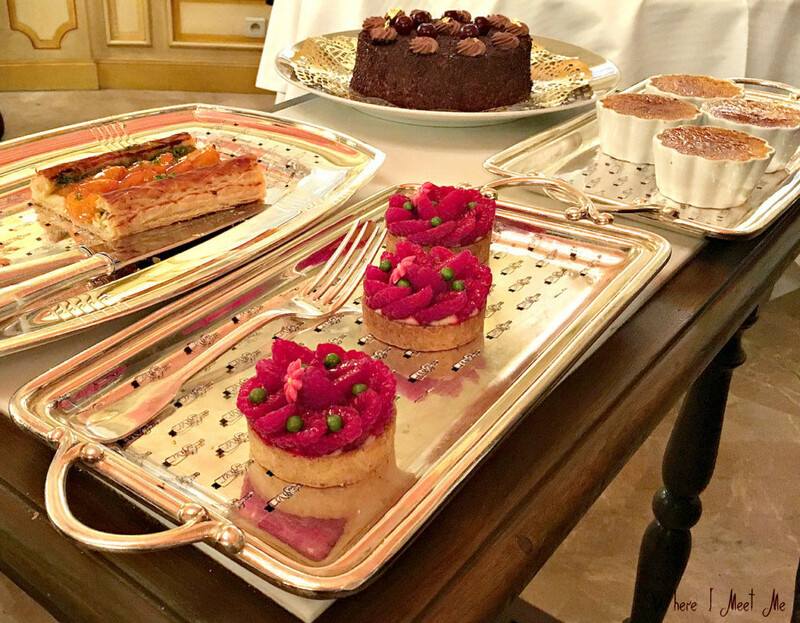 Cake-stands with mini-desserts and amuse-bouches are standing in neat rows. Have a look at this video– it’s something surreal! Have you seen the fish-shaped pie on 1:45? And have you seen the chef playfully frying the red mullet filet with potatoes on top – around 2:16? These are just a few of the famous Paul Bocuse recipes, which are now part of the world’s culinary heritage – “sea bass in puff pastry shell, choron sauce” and “red mullet dressed in crusty potato scales” – AND we cooked them with our own hands during our 1 week program at the Institution Paul Bocuse. What an unbelievable feeling to taste a Michelin 3-star dish that you have just cooked yourself! It’s fantastic!.. And there will be a separate post on this, so stay tuned. And our tour of the restaurant continues in the wine cellar with 20 000 bottles and we get to see the personal wine stock of monsier Bocuse. 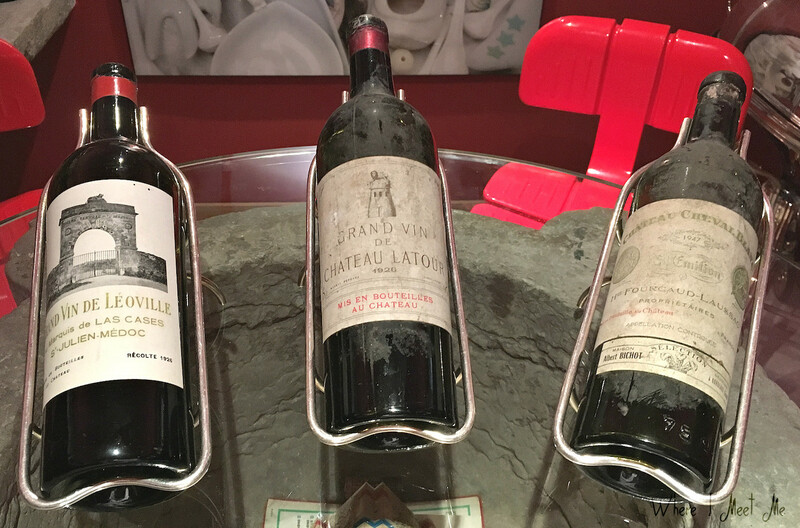 The sommelier tells us that he had recently disapproved the new design of the restaurant’s wine list – he said it’s too heavy, and that clients won’t like to hold it in their hands. That’s the passion of the master of his trade – he is still interested in every detail. Thank God, in our menu the wines are already selected to match the meal. The refreshing Viognier goes with the fish, and the no-nonsense Chateauneuf-du-Pape for those brave enough for a meat main course. We were pre-warned before our dinner at Paul Bocuse restaurant – now I am passing this important knowledge to you – the meals are prepared according to the historical recipes, and some of them are 60 years old. So the advice we were given was to make wise menu choices – as the size of the portions back then was much bigger, and, let’s say, more filling – hello to cream and butter in almost each recipe! But it’s so tempting to try everrrrything! The toughest choice of the evening was starters: foie-gras or lobster??!! 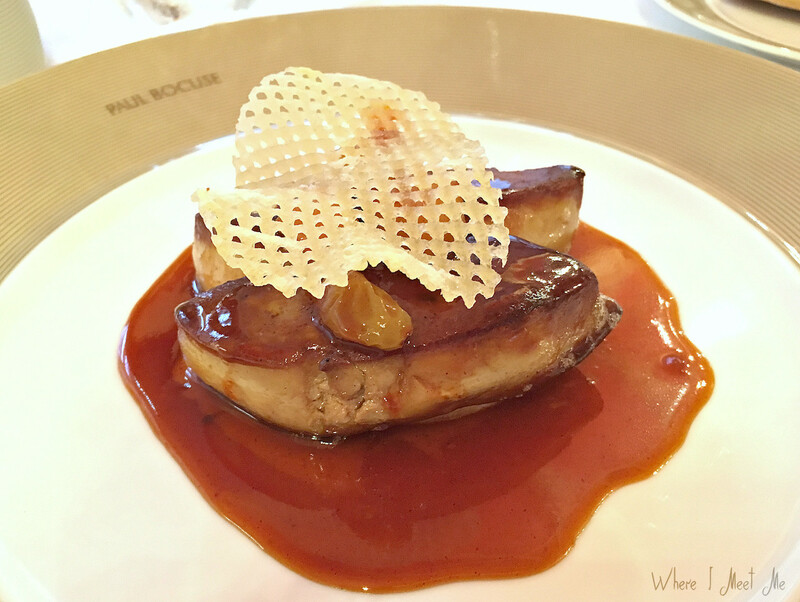 I confess, I was the lucky one – I got to try foie-gras (certainly best in my life) from my husband’s plate, and my lobster was amazing – well, you can see that, I’m sure. So, as we were promised, everyone was full already after starters, but not a single person skipped the desserts. Because isn’t three courses of desserts already a good reason to dine in Michelin restaurants??!! To be honest, it’s really hard to describe any further – so I leave you to enjoy the visual delights. Hi, I’m Ksenia Kourilkina. This blog is officially started solely for the fun of it 😃 Glad you’re here, too! I live in the suburbs of Moscow with my husband and 2 cats, have a rewarding job and practice arts. I've recently decided to take 3 months off, so I can slow down, create space for new stories and refresh my choices. Switch off the ticking-the-box mode, quiet down and explore. Don’t know what comes but I will be sharing the highlights here on whereimeetme.com. Excited! Would love to be in touch with you. est.2017 - WhereIMeetMe - Блог Ксении Курилкиной ©All Rights Reserved.